Christmas Day, the day whose purpose seems to consist solely of an evening, with a Christmas tree at the center and happy give and take among the family members. Wistful feelings overcome me. For 29 years, this is the first time of spending that evening not with my family. Even though I stand on patriotic ground, we miss out on the winter landscape that is presented at home and which is connected so closely with this day. Truly glowing wishes and thoughts I send home from the Red Sea, as Phoebus is not considerate of us. In the sun, we have more than 40°, in the machine room over 60° Celsius, plus a glowingly hot South-Southeastern wind that takes away all refreshing effect out of the air. Clam and I smiled as we dressed up a small Christmas tree I had taken along from the woods in Konopiště and were sweating copiously: „from the hot brow, sweat must flow”. Every quarter hour we hurried on deck to breathe better air as the oppressing mugginess below deck was barely supportable. The lights and other objects which my mother has given me to decorate the tree were showing signs of the tropical heat too: They had become all soft and started melting. During the day, I saw for the first time flying fishes which flitted swift as an arrow above the waves and resembled large butterflies with their shiny wings. On the aft deck we caught some large locusts whose flying skills I admired as the next stretch of land lay 56 sea miles distant from the ship. The poor animals were very exhausted and therefore easy to catch! Just after dinner we ignited the lights of the Christmas tree and started a small ceremony in my cabin to which besides the gentlemen of my suite had assembled Leopold, the captain and the officer of the day?. Many different small presents including many surprises from home secretly taken aboard were laid out on the table. Based on an invitation of the officer corps, I went to the Carré where the gentlemen had put up a beautiful Christmas tree that was covered in artificial cotton snow flakes and with its many lights was shining very merrily and clear. A joke tombola with the strangest of objects started the feast, while our chief medical officer Dr. Plumert brewed a tremendous pineapple mulled wine. With the first cup, the captain remembered in warm words all those left behind at home who were certainly with us on this day in thoughts. Afterwards, there were musical numbers. A cadet played the zither magnificently, while other gentlemen were putting the piano through its paces. The singing also commanded the attention and I felt very much at home, listening to so many truly Austrian melodies. So many canons, so many soldierly songs showed at least the good will as well as the love of our compatriots for their local songs. To my great delight I discovered a talented fellow yodeller in the person of our navigation officer. The captain and an engineer were so kind to join in and so we four yodelled all those famous yodel songs such as »Auerhahn«, »Zillerthal«, »Zwa Sterndia am Himmel« out into the Red Sea. A few weeks ago I had listened to the yodellers and hurrahs in the Salzburg mountains among firn and ice, as the hunters and boys were gaily singing during the chamois hunt in the cold but delicious morning, so that the echo resounded a hundred fold against the walls and Alpine bowls – and now we were singing the same songs swimming in the ocean at 40° Celsius. What a strange contrast! In unadulterated hilarity we passed the evening and it was late when I went up to the bridge to dream a bit more about the glorious starry sky. 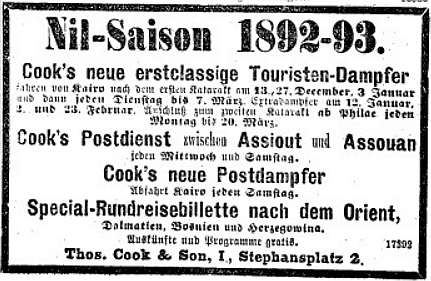 ANNO – on 24.12.1892 in Austria’s newspapers. On 23 December, the Prague diocese excommunicated a fallen priest („große Excommunication“). Out of Lemberg, Galicia, it is noted that 80,000 inhabitants emigrated. Hamburg counts two cases of cholera, one a local man who died. Budapest notes that it counts zero cases of cholera. 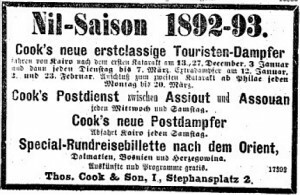 Thomas Cook & Sons on Stephansplatz, Vienna, promote tours on the Nile. Dieser Beitrag wurde am 24. December 2017 von wordpressadmin in diary veröffentlicht. Schlagworte: December, on ship, Red Sea.